The drive from Ladysmith, Wisconsin to Peshtigo, Wisconsin largely follows Highway 8 through the heart of the state's 16 million acres of forested land. The drive carries you through rural communities like Tony, Ingram, Prentice, Clifford, and Rhinelander before having to push south through the Chequamegon-Nicolet National Forest. Peshtigo sits just below the boundary to the Upper Peninsula of Michigan and a stone's throw from Green Bay. In October of 1871, a massive fire ripped through the area destroying miles and miles of forests and claiming well over 1000 lives. This fire would likely have lived in national infamy had another fire in nearby Chicago not have occurred at the same time. In more recent history, the pellet facility in Peshtigo serves as a great example of how wood pellet manufacturing is a perfect complement to other wood product manufacturing facilities. In May of 2017, Lignetics purchased the facility from the Marth Companies LLC as a part of a larger acquisition that included two other production facilities in the state as well as Marth's trucking assets. The facility in Peshtigo relies upon a partner across the road, Aacer Flooring, to provide their needed feedstock. Aacer's facility is capable of manufacturing 35 million board feet of hardwood flooring every year, according to the company's website, and the sawdust from the Aacer facility is simply delivered across the road to the Lignetics facility and introduced into the production environment. 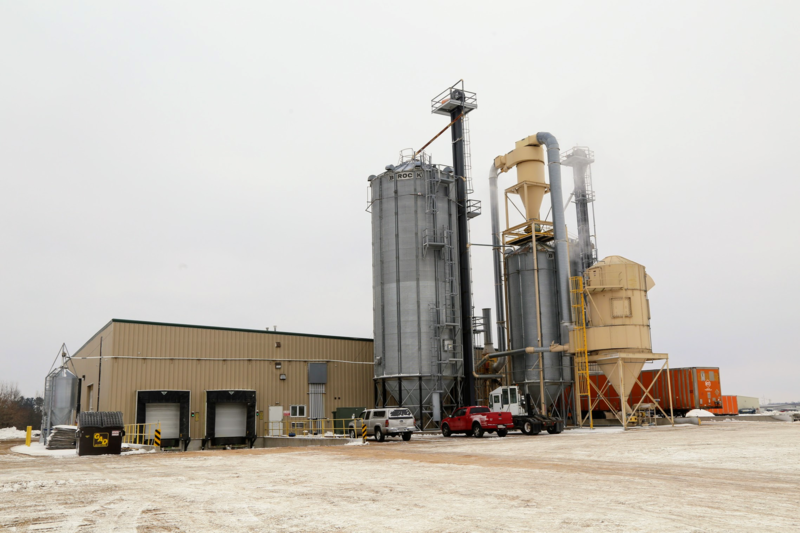 As a result, the facility in Peshtigo really doesn't need the log handling and size reduction infrastructure that a pellet facility like member-producer Indeck Energy Wood Pellets has. 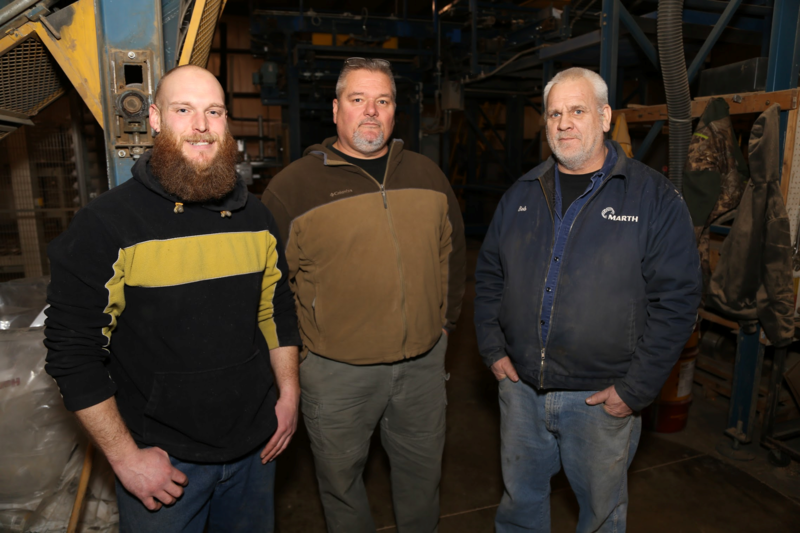 from left to right: Shawn Haulotte, Mike Oleck, and Bob Grischow. In talking with the team at Peshtigo it was clear that December's arctic air was impacting their business and retailers were moving the inventory they had and were calling for more. As I pulled up to the facility, a semi loaded with pallets of pellets was just pulling out and by the time my host, Mike Oleck, led me onto the production floor another load of pellets was being staged and loaded. Mike and I ducked back into his office so that he could speak briefly with the gentleman driving the truck that was being loaded. It occurred to me then, how much business our industry generates for our freight logistics partners. Inbound material, bulk shipments to distribution centers, and eventually LTL deliveries all across our industry add up. All of you know full well your own contributions to the trucking industry on an annual basis. I thoroughly enjoyed my time at the Lignetics-Peshtigo facility and Mike Oleck and his team were more than welcoming. They even tolerated my efforts to get my camera properly set to capture their finished product whizzing by on a conveyor belt. Beginning the drive back to the Twin Cities, I found myself thinking about Mike and his team certainly but also the extended team in and around Peshtigo, including their feedstock partner across the street at Aacer Flooring, as well as their roster of owner/operator logistics providers. Laid out before me in Peshtigo, was the important story of how rural manufacturing boosts all sorts of other local businesses. Our industry is an important piece of this rural manufacturing puzzle and I urge all of us to think about how we can maximize on the consumer goodwill that arguably surrounds quality, locally manufactured products. We need photos of PFI members, along with their product and facilities, to feature at Breakfast & Biomass! Don't get left out - email your photos to Carrie Annand. A combination of record-breaking cold and rocketing heating fuel prices have nearly made it official-the 2017-'18 heating season will serve as a healthy rebound for Northeast wood pellet businesses, and likely a solid season across the board for U.S. producers. The week ending Jan. 6 was approximately 34 percent colder than normal for the U.S., with parts of the eastern U.S. at 62 percent colder than average. Limitations on regional national gas in New England resulted in spiking prices and increased oil burning for electricity generation. In New York, utility Central Hudson informed customers that record amounts of natural gas were consumed by customers during an intense cold snap beginning on Jan. 5-breaking records on two consecutive days-and advised customers to turn down the heat when leaving their homes, as widespread demand was causing gas and electric supply costs to surge. That same week, ISO New England released statements issuing concerns about the distribution of fuel inventories across the region, and emission limits for some generators for the remainder of the winter. "Because of the region's heavy reliance on oil-fired power plants for the past 12 days, several are running low and fuel replenishment will be critical for these facilities, especially if the region encounters another cold snap soon after this one...a few power plants have reported that they are nearing their emissions limitations. The cold weather continues to affect wholesale energy prices, as well as the types of power plants that are being used to meet demand." The bitter arctic cold snap that hit this month has many Vermonters thinking about keeping their homes and businesses warm with wood and pellet stoves, but did you know that the Vermont State Archives, home to the Constitution, is also heated with wood? Last fall the Department of Buildings and General Services (BGS) replaced the aging boilers in the State Archives in Middlesex with two new automatic Froling wood pellet boilers. This heat plant will use regionally sourced pellets to provide heat to the building that houses vital records, including the State's constitution. It is the first part of an efficiency overhaul at the archives. The new boilers will displace 180 metric tons of CO2 equivalents annually, that's equivalent to taking 38 cars off the road! The State will also save nearly $40,000 each year by switching from oil to pellets. Lignocellulosic biorefineries' development and operation have suffered from failing to account for the complexity and variability of feedstock properties and composition, lack of fundamental understanding of the physics and chemistry of biomass-derived feedstock preprocessing and subsequent deconstruction, poor equipment design, and flawed integration. Understanding the potential range of desired biomass specifications will enable effective handling strategies and will lead to predictable conversion performance in lignocellulosic industrial biorefineries.